Hello and Welcome! Thank you for visiting us! 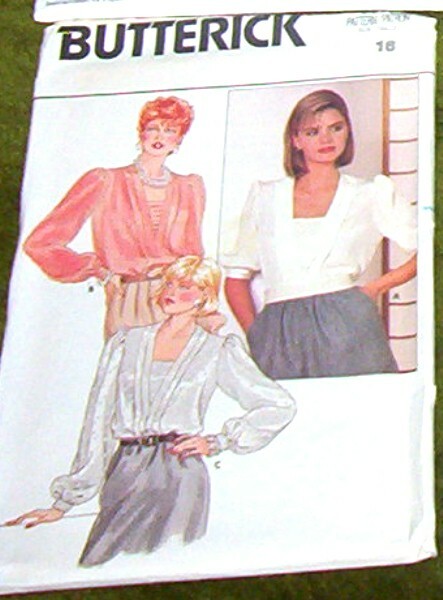 On our site you will find vintage patterns from the 1940's-1990's. 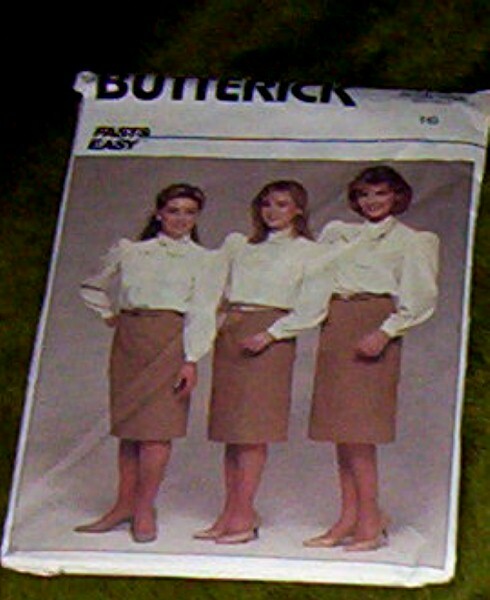 All our Patterns are from local area Estate Auctions or Sales. 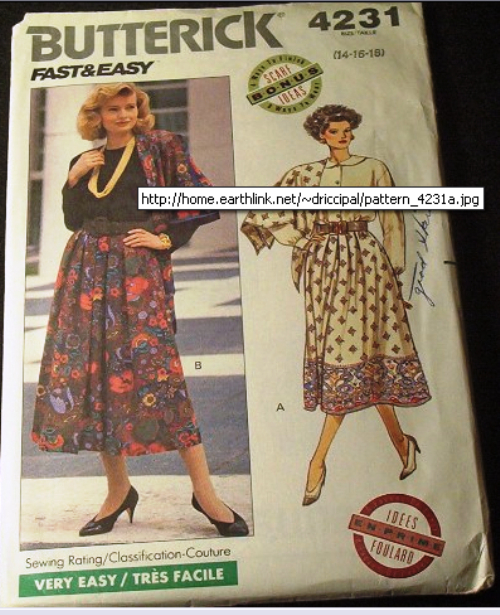 All Patterns are vintage; cut or uncut originals. Our Patterns may have some envelope imperfections such as; crinkling, flap tears, pinholes, etc. Excessive envelope wear will be noted in description. We will not be responsible for smoke odor. 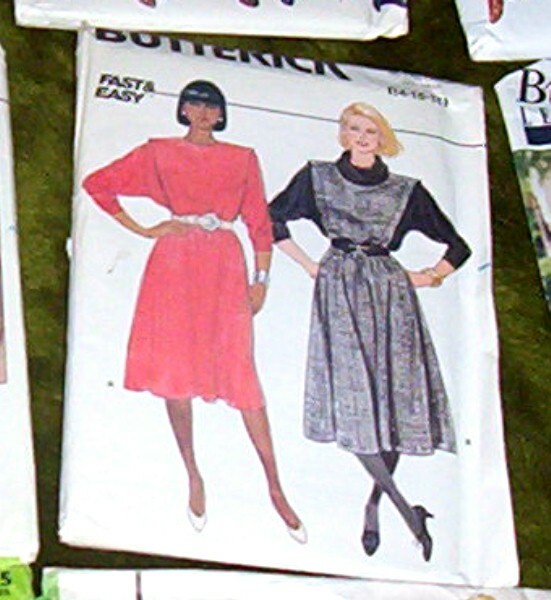 Most of these are very old patterns and people did smoke during these eras. 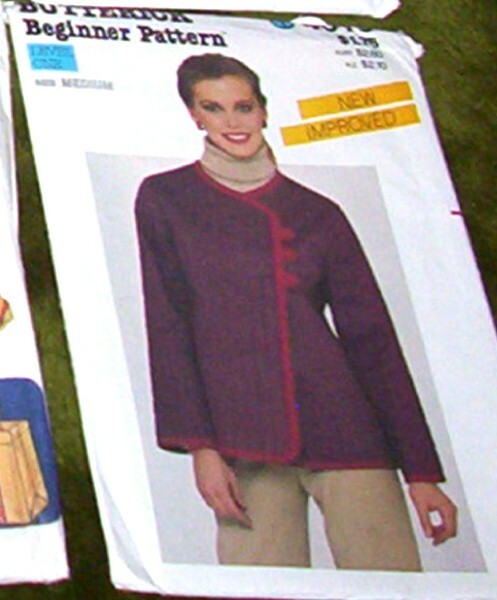 If this concerns you email us about the pattern you're interested in for a complete description of the packaging. All Patterns are inspected for completeness. Our goal is 100% Customer Satisfaction. Check our feedback. We reserve the right to not sell to any country with restrictions, so contact us about your country. All patterns shipped USPS 1st Class Mail (up to 13 oz.) and media mail for larger packages. We use a large brown envelope and patterns are enclosed in zip lock bag. If you'd like another shipping method, please let us know when you email us (other shipping methods may increase the shipping cost). Please contact us for international shipping quotes. 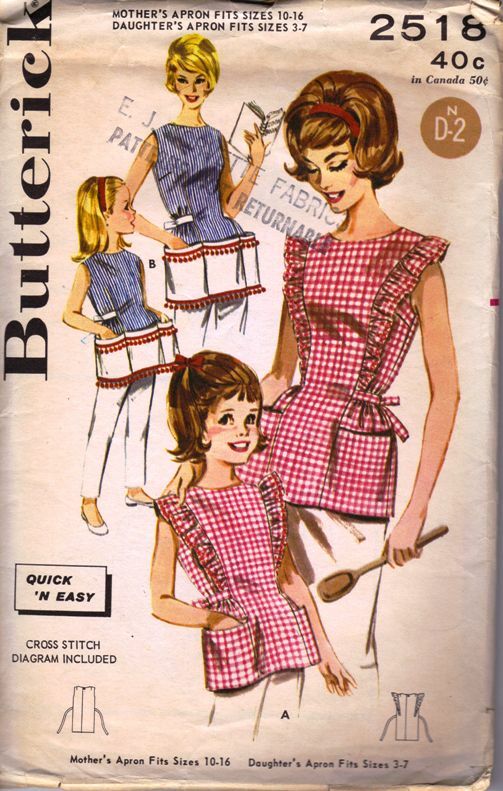 Back buttoned, shallow necked cobbler aprons, back tied belt from front darts. Large pockets. (a1, a2) Self ruffle trim with cross stitch design for gingham checks only. Large patch pockets. (b1, b2) Contrasting belt and large front pockets. Ball fringe trim. 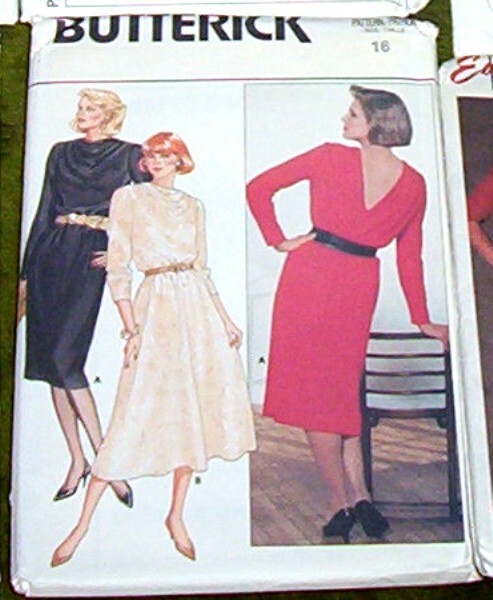 Very loose fitting, straight dress, below mid-calf or shirt has collar, dropped shoulders, shoulder pads, yoke, with forward shoulder seams, front and back pleats, shaped hemline and long sleeves rolled-up (wrong side shows). Narrow hem. 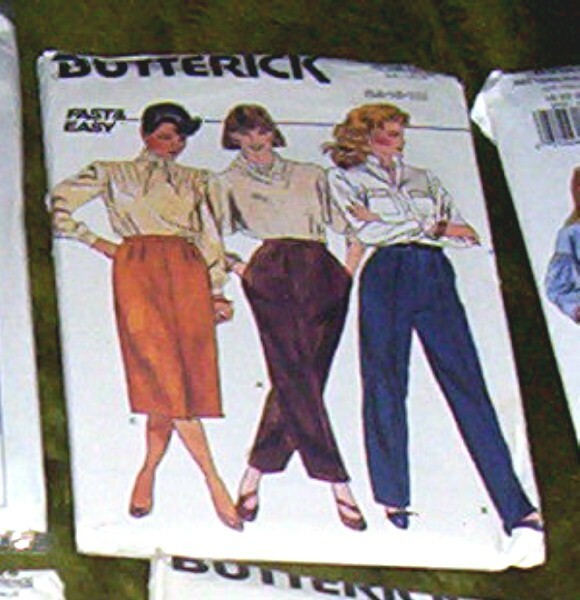 B, C: pockets. 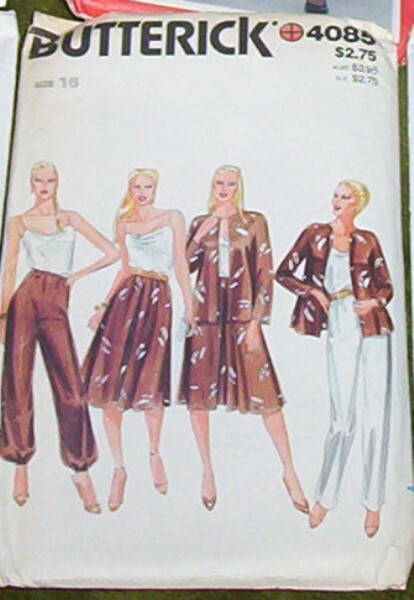 Tapered pants have elastic waist. 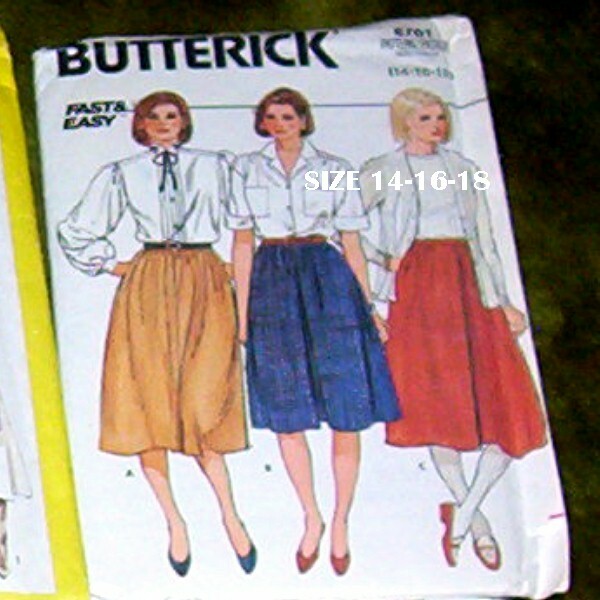 Skirt, below mid-calf, has waistband, front pleats, back gathers and back zipper. A. dimdl B. slightly flaired. Single layer, square scarf has narrow hem, or is self fringed. Purchased top and belt. 36/38/40 28/30/32 38/40/42 Skirt, Scarf A: Border Prints. Skirt B: Lightweight Woolens, Lightweight Stable Knits, Challis and Lightweight Broadcloth. Scarf B: 36" (92cm) Square Print. Scarf Fabric: Unsuitable for obvious diagonals. Plaids and Stripes allow extra fabric. Fabrics: Ltwt Broadcloth, Ltwt Woolens, Crepe, Ltwt Linen and Ltwt Poplin. Georgette, Crepe de Chine, Challis, Tissue Faille and Ltwt Crepe, also Lace for Contrast. Lightweight Woolens, Linen, Ltwt Broadcloth, Wool Crepe and Synthetic Leather and Suede. Jersey, Wool Crepe, Ltwt Broadcloth, Tissue Faille and Challis. Tissue Faille, Crepe de Chine, Challis, Ltwt Damask and Wool Jersey. 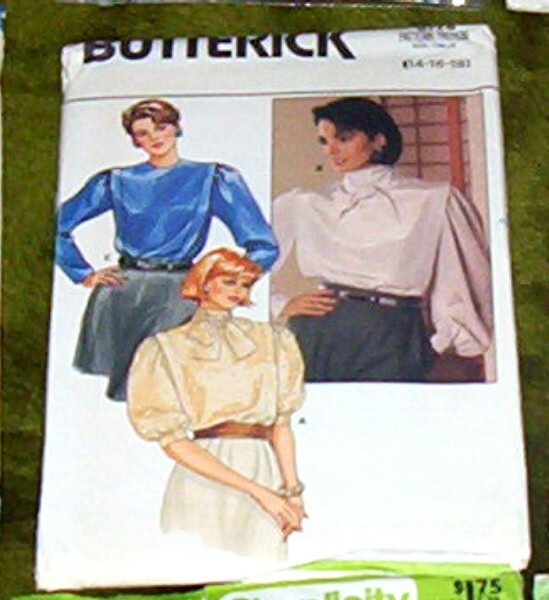 Fitted top has side panels (no side seams), peplum and three-quarter or long sleeves pushed up. B: shaped peplum. 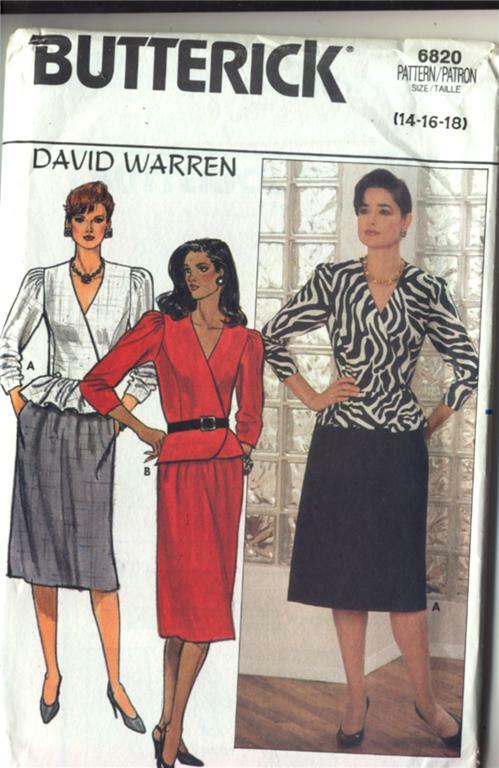 A-line skirt below mid-knee, has waistband, side pockets and back zipper. Purchased belt. Crepe de Chine, Ltwt Broadcloth, Wool Crepe and Brocade. Unsuitable for obvious diagnals, plaids or stripes. Fabrics: Ltwt Woolens, Ltwt Pinwale Corduroy, Poplin, Linen and Chino. © 2005 - 2013, The Estate Sale Store, All Rights Reserved. Contact us if you'd like to borrow any images or copy from this site.